Flea is the common name for insects of the order Siphonaptera which are wingless insects whose mouthparts are adapted for piercing skin and sucking blood. 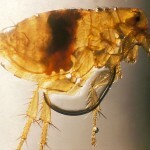 Fleas are external parasites, living by hematophagy off the blood of mammals and birds. They are agile, usually dark colored (for example, the reddish-brown of the cat flea), wingless insects with tube-like mouth-parts adapted to feeding on the blood of their hosts. Their bodies are narrow, permitting easy movement through the hairs or feathers on the host’s body (or in the case of humans, under clothes). Their legs are long, the hind pair well adapted for jumping (vertically up to seven inches; horizontally thirteen inches), around 200 times their own body length, making the flea one of the best jumpers of all known animals (in comparison to body size), second only to the froghopper. Fleas lay tiny white oval shaped eggs. Their larvae are small and pale with bristles covering their worm-like body. While the adult flea’s diet consists solely of blood, the larvae feed on various organic matter, including the feces of mature fleas. In the pupal phase the larvae are enclosed in a silken, debris-covered cocoon. PEST CONTROLFleas attack a wide variety of warm-blooded vertebrates including dogs, cats, humans, chickens, rabbits, squirrels, rats, ferrets, and mice. Fleas are a nuisance to their hosts, causing an itching sensation which in turn may result in the host attempting to remove the pest by biting, pecking, scratching, etc. the vicinity of the parasite. Fleas are not simply a source of annoyance, however. Some people and animals suffer allergic reactions to flea saliva resulting in rashes. A-Best Pest can prevent FLEAS from becoming a permanent guest. CALL TODAYWe accept all credit and debit cards!